We went to the Biltmore this weekend for some relaxing family time!!! The Spring flowers, especially the azaleas, were in peak bloom! I thought I'd share some pictures with you! The girls were getting sillier and sillier! One of the kids took this pic of me and Hubby! They did pretty good :)! Everything was SO beautiful! We just loved wandering the Gardens! We had a great time together! We toured the gardens and the Biltmore house, went to the children's petting barn, and also did some local shopping!! The prices were pretty high in Asheville, in my opinion, but I managed to snag a few vintage treasures anyway!! 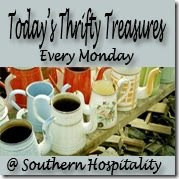 So I thought I'd join in Rhoda's Today's Thrifty Treasures party! I got this fun old galvanized tin seed tray! Love the slots on either side of the handle for a label! A 1950's globe and a fun Florida tea towel with pink flamingos on it (!) round out my fun finds! I have some fun posts planned this week, so come and visit again! What a fun weekend.....and I think I am seeing double. Just kidding....those girls are adorable! Love your finds! Stacey - your girls are adorable! Looks like the fam had a great time! And you scored big with those thrifty finds - way to go girl!!! The girls laughing reminds me of my sister and I when we were young laughing at the silliest things...my mom always said we had "giggle itis"
You and your girls are so sweet! I love the pictures!!! We toured Biltmore at Christmas 2007. We'd love to go back sometime! You found some wonderful things. I love the seed box. I love Biltmore - we have year long passes but don't get to use them as often as we'd like. Great pictures, I love your finds too! Wow those azaelas are huge! Great finds too! Didn't you just love the Biltmore? We love it there and look forward to visiting again and again. You really found some great things. The seed box has so many possibilities and the colors in the Florida towel were beautiful. Oh man, I want that seed tray. :) It is beautiful! Great weekend and I'm loving your seed tray!!!! LOVE all your fun finds. I want one of those towels with my state on it? Is it vintage or current? What a beautiful family! I hope to one day go to the Biltmore. It looks beautiful. Love all of your fun finds too! Great finds, and your family is beautiful. I dress my boys alike a lot too because they are only a year apart. Don't you just love Biltmore? We love to go at Christmas and see all their spectacular trees. Adorable photos! We spent the weekend in Williamsburg and had a great time too. Could your family be any cuter? Seriously! The cutest...ever! Beautiful! The pictures are great!!! Creating a Welcoming Home for Spring!